All talk in the bars and cafe’s of Spain is of Ronaldo and Bale or maybe Messi or Xavi, but you may be surprised to know that Spain has a thriving Women’s rugby scene. Currently there are over 200 women’s teams in Spain and a very competitive league. The origins of women’s rugby in Spain can be traced back to 1913, when women played in secret in school, but rugby first began to be played seriously at the School of Architecture of Madrid in the early 1970s by a group of architecture students. In the late seventies a group of female PE students taught by Jose Antonio Sancha, a professor of Rugby at Barcelona INEF, decided to train with the men and played the game seriously, although they were not recognised by the Catalan Federation rugby until 1983. The first game was played in Barcelona between the BUC and INEF, other clubs quickly formed in different parts of Spain, but in the early years most of the clubs were centered around Barcelona and Madrid. The game then spread to the Basque Country and Valencia, and In 1991 there were 27 women’s teams participating in regional competitions. The Spain national women’s team played in Cardiff at the Rugby World Cup, where they were placed fifth, behind the United States, England, France and New Zealand. In 1994, the Spanish team suffered because of budgetary problems, and were unable to travel for international tournaments. In 1995 Spain became the unexpected champions of the first European Championship by defeating France, in the final 21-6, and 1996 championship brought a repeat of that final but this time the Spanish lost 15-10. In January 1997 Spain visited England to take on the World Champions and nearly caused an almighty shock, they led England until 10 minutes from the end of the match, and only a last-minute try by England gave them the win. The 2002 World Cup was held on home soil in Barcelona, New Zealand retained its title beating England 19-9 in the final at the Olympic Stadium. Spain were also members of the Five and Six Nations from 2000 to 2006, finishing third on three occasions and winning 10 of the 33 games they played. However in 2007 they were replaced by Italy because the Six Nations Committee wished to align the women’s tournament with the men’s,and they were replaced by Italy. This severely reduced Spain’s opportunities to play top-level international rugby, and may have been a factor in Spain’s failure to qualify for the 2010 World Cup. However in the last World Cup held in France, in 2014, Spain beat South Africa 36-0 in the 9th place play off, having beaten Kazakhstan 18-5 , and losing to England and Canada in the group stages. 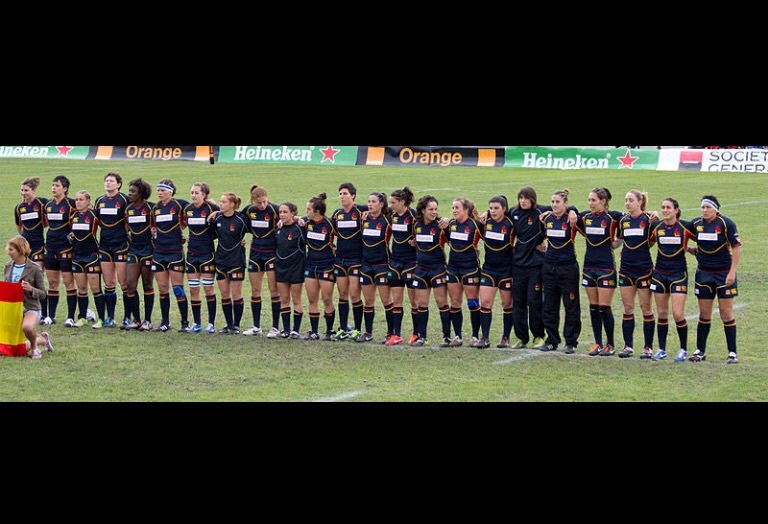 Spain could be a leading light in the future of women’s rugby.